PHOTO BY ERIKA NORTON Local pharmacies are reporting having trouble getting Epipen, the life-saving drug severe allergy sufferers depend on in an emergency. Mylan’s EpiPen sales practices in the U.S. sparked public outrage in 2016 after consumers saw the price for a pack of two auto-injectors rise from $100 to over $600 in less than a decade. Since then, the company has launched a generic version of EpiPen for half the price at around $360. Then in March 2017, Mylan recalled thousands of devices after complaints that some had failed to activate. In early September 2017, the FDA issued a warning letter to Meridian, a facility where EpiPen and EpiPen Jr. are made for Mylan. The letter warned Meridan for significant violations of current good manufacturing practice and failing to investigate hundreds of complaints about defective EpiPens, including cases where patients were hurt or died due to faulty injectors. In response to the letter, Mylan said that the FDA warning did not “affect Pfizer’s ability to manufacture and supply” products from the facility. But now, both Canada and the United Kingdom are reporting shortages of EpiPen, as well as the U.S.
SUSSEX — A number of pharmacies in the Sussex County area are reporting having difficulty getting EpiPen, devices that deliver the life-saving drug that severe allergy sufferers depend on in the event of a potentially fatal emergency. 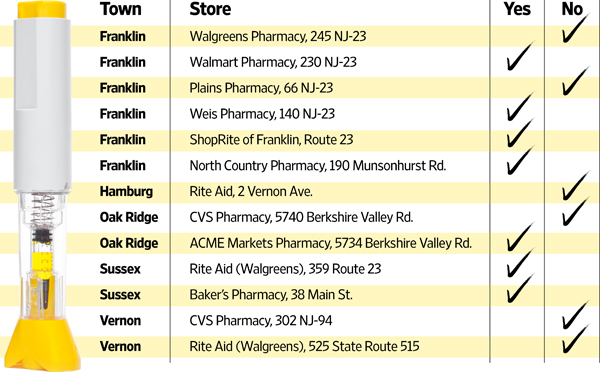 According to a survey of 36 pharmacies in Northern New Jersey, 16 pharmacies said they had some version of the EpiPen, whether it be the brand name or generic, in stock, while 14 pharmacies said they did not have any EpiPen at the moment. Six pharmacies did not respond. At West Milford Pharmacy & Gift on Union Valley Road, Pharmacist Danny Gutkind said that the wholesale distributor they use, AmeriSourceBergen, only carries a few EpiPens at a time, so they usually order every day — “sometimes they have it, and sometimes they don’t.” Right now, he said they have one generic version available, and the EpiPen brand is expected on May 31. National shortage?Some experts say there is a national shortage, including the American Society of Health-System Pharmacists (ASHP). The group said that they determined there was a shortage of epinephrine auto-injectors from two major manufacturers: Mylan Pharmaceuticals, which makes EpiPen, EpiPen Jr., and authorized generic versions of both, and Impax Therapeutics, which makes an authorized generic version of Adrenaclick. Plus, more than 400 patients in 45 states reported difficulty filling prescriptions for EpiPen and other epinephrine autoinjectors since May 2, according to patient-advocacy group Food Allergy Research & Education. Despite these claims, the U.S. Food and Drug Administration says that Mylan has continued to report adequate supply of EpiPens in the U.S., and has not added EpiPen devices on its list of medical shortages. Four other pharmacies in Newton reported not having EpiPens in stock. In West Milford, only one out of the three pharmacies called had EpiPen in stock, and both pharmacies called in Vernon were out. All three pharmacies in Sparta had EpiPen or the generics in stock, as well as pharmacies in Franklin, Sussex, Oak Ridge and Stanhope. Some pharmacies reported having only EpiPen Jr. available, which is a lower dose for young children. EpiPen prices ranged from $500 to over $700. The generic EpiPen ranged in price from $300 to $375. The few alternative options to EpiPen include Adrenaclick and it’s generic version, which are available at CVS pharmacies for about $100, as well as Auvi-Q, an often times much more expensive option costing several thousand dollars. But these options will not help patients trying to fill prescriptions for EpiPen. “It all depends on how the doctor writes the prescription,” Clark said. She said that as far as their supply at Weis Markets Pharmacy, there is no date listed as to when they can expect more EpiPen.